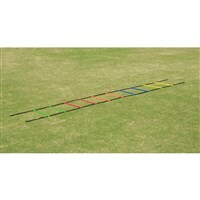 This newly designed fixed rungs agility ladder consists of 4 different coloured ladders Red / Blue / Yellow & Orange. Each ladder is available in 2m, 4m, 9m standard lengths and also in any customized length. 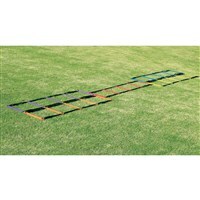 These ladders would help an athlete to do different kind of drills by varying their arrangement. Please see the illustrations on the side to show how these ladders can be used. Also available in adjustable model, please ask for more details. 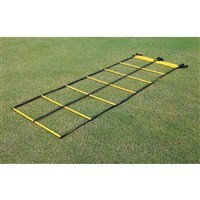 AGL-QD02MF ...... ...... 2m long with 5 rungs - Set of 4 colour Ladders. 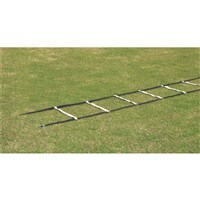 AGL-QD04MF ...... ...... 4m long with 10 rungs - Set of 4 colour Ladders. 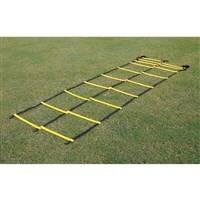 AGL-QD09MF ...... ...... 9m long with 21 rungs - Set of 4 colour Ladders. This exclusive new ladder consists of 6 different coloured ladders Red / Blue / Green / Yellow / Orange & Purple. Each ladder is available in 2m, 4m, 9m standard lengths or in any customized length. Jointer for joining all the ladders is also included. 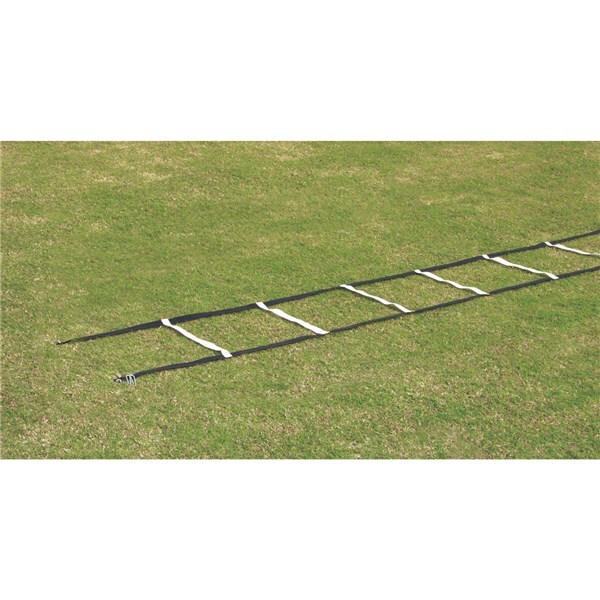 These ladders would help an athlete to do different kinds of drills by varying their arrangement. Ladder rungs are flat and adjustable. Please see the illustrations on the side to show how these ladders can be used. Also available in fixed model, please ask for more details. AGL-MG02MFA ...... ...... 2m long with 5 rungs Set of 6 Ladders. AGL-MG04MFA ...... ...... 4m long with 10 rungs Set of 6 Ladders. AGL-MG09MFA ...... ...... 9m long with 21 rungs Set of 6 Ladders. 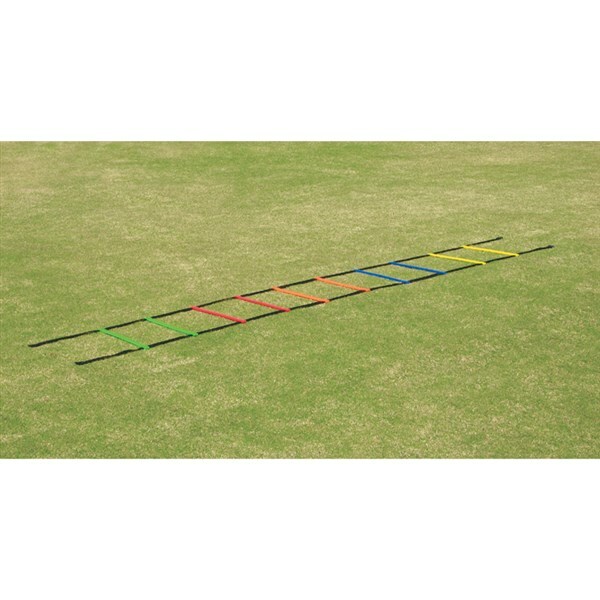 Agility Ladder made of hoops with alternating Red / Yellow / Green & Blue fixed to the web. Easy to fold and packs up neatly in a mesh carrying bag. 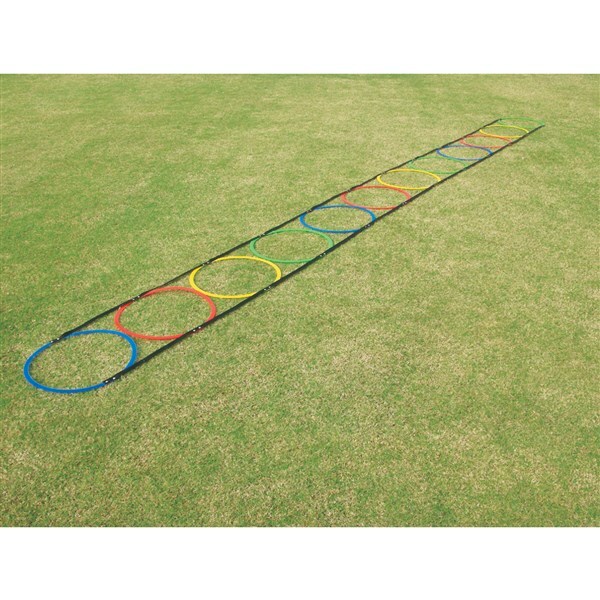 This is an economical option to perform various kinds of drills using multi-colour hoops. 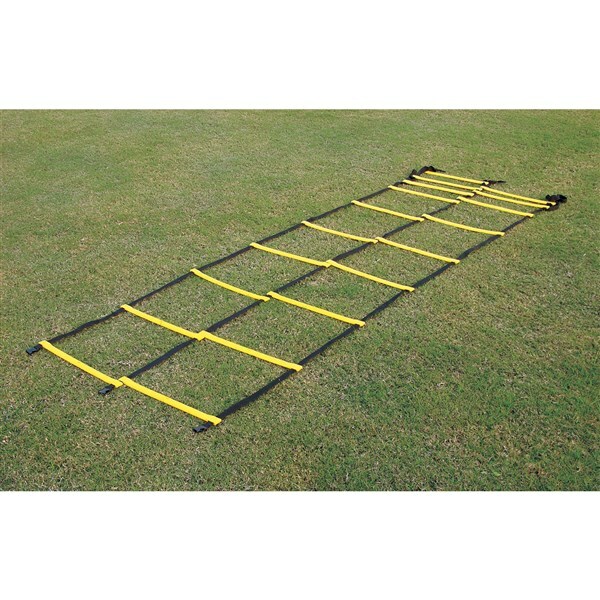 Two or more hoops ladders can be used to make more complex drills. Please see the above illustrations to show how these ladders can be used. AGL-HP12 ...... ...... 12 Hoops Ladder. 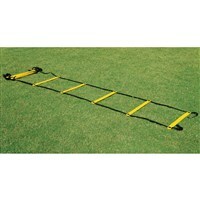 AGL-HP24 ...... ...... 24 Hoops Ladder. 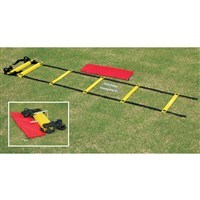 Agility Ladder with double block pattern is one of the most effective training aid for athletes and sports players. 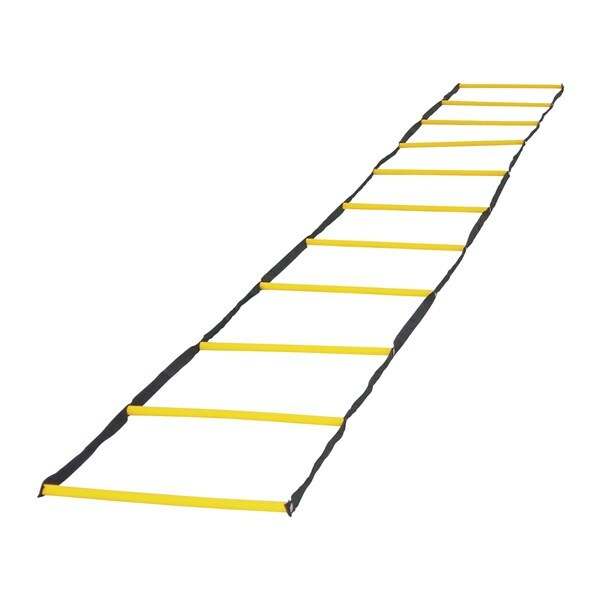 The double blocks of the ladder are useful for practicing varied foot movements. Each set consists of 10 x 100 cm long poles, light in weight, attached to the belt at a distance of 45 cm. Each block size measures 50 cm x 45 cm. AGL-DR04ML ...... ...... 4 m long with bag made of light weight fabric. AGL-DR09ML ...... ...... 9 m long with bag made of light weight fabric. AGL-DR09MLP ...... ...... 9 m long with bag made of heavy weight fabric. AGL-DR04MLP ...... ...... 4 m long with bag made of heavy weight fabric. 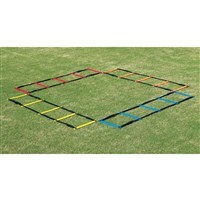 Agility Ladder with double block pattern is one of the most effective training aid for athletes and sports players. 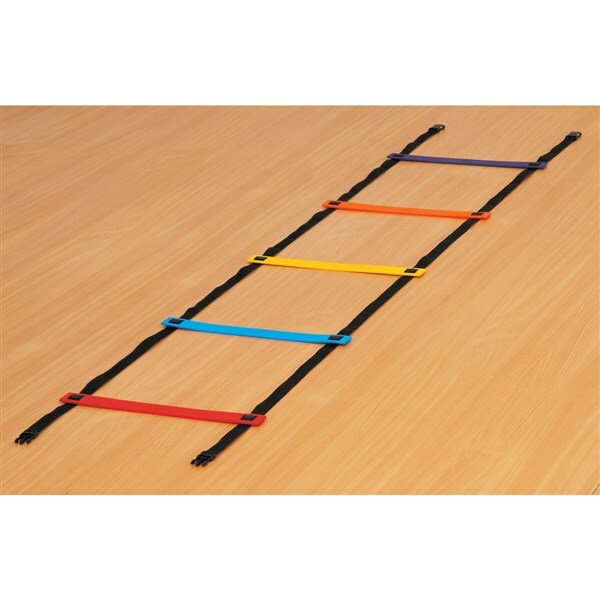 The double blocks of the ladder are useful for practicing varied foot movements. Each set consists of 10 x 100 cm long poles, light in weight, attached to the belt at a distance of 45 cm. Each block size measures 50 cm x 45 cm. This ladder can be adjusted i.e. the user can increase or decrease the distance between 2 rungs and can also make alternating pattern for different types of drills. AGL-DF04ML ...... ...... 4 m long with bag made of light weight fabric. AGL-DF09ML ...... ...... 9 m long with bag made of light weight fabric. AGL-DF04MLP ...... ...... 4 m long with bag made of heavy weight fabric. AGL-DF09MLP ...... ...... 9 m long with bag made of heavy weight fabric. 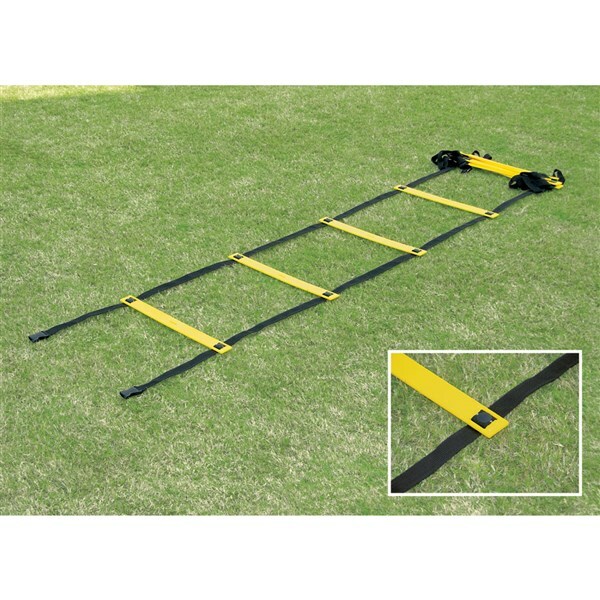 This adjustable ladder comes in Multi Colour. Two rungs each of Red / Yellow / Blue / Orange & Green in 4 m ladder and four rungs of each colour in 9 m ladder. AGL-F04MC ...... ...... 4 m long with bag made of light weight fabric. AGL-F09MC ...... ...... 9 m long with bag made of light weight fabric. AGL-F04MCH ...... ...... 4 m long with bag made of heavy weight fabric. AGL-F09MCH ...... ...... 9 m long with bag made of heavy weight fabric. AGL-FA04M ...... ...... 4 m long with bag made of light weight fabric. AGL-FA09M ...... ...... 9 m long with bag made of light weight fabric. AGL-FA04MH ...... ...... 4 m long with bag made of heavy weight fabric. AGL-FA09MH ...... ...... 9 m long with bag made of heavy weight fabric. 2 rungs each of Red / Yellow / Blue / Orange & Green in 4m ladder and four rungs of each colour in 9m ladder. AGL-FA04MC ...... ...... 4 m long with bag made of light weight fabric. AGL-FA09MC ...... ...... 9 m long with bag made of light weight fabric. AGL-FA04MCH ...... ...... 4 m long with bag made of heavy weight fabric. AGL-FA09MCH ...... ...... 9 m long with bag made of heavy weight fabric. 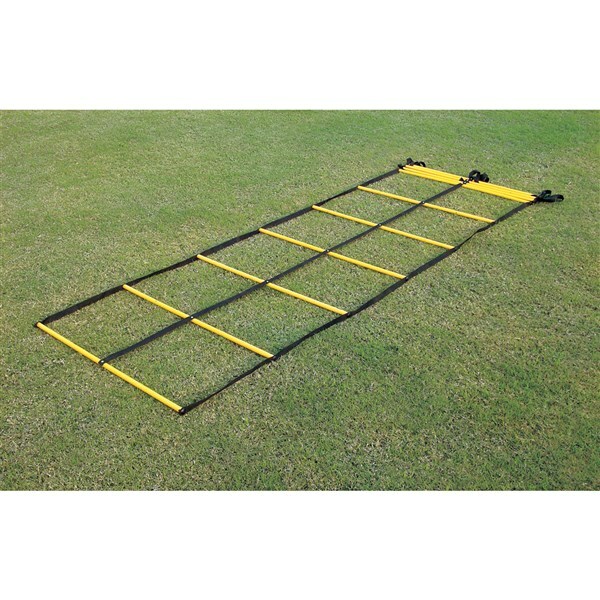 New design flat fixed Agility Ladders with 50 cm wide rung and extendable clips for increasing the length of the ladder. It comes in yellow colour as a standard. AGL-SPR02MW ...... ...... 2 m with light fabric bag. SINGLE. AGL-SPR04MW ...... ...... 4 m with light fabric bag. SINGLE. AGL-SPR09MW ...... ...... 9 m with light fabric bag. SINGLE. AGL-DSPR02MW ...... ...... 2 m with light fabric bag. DOUBLE. AGL-DSPR04MW ...... ...... 4 m with light fabric bag. DOUBLE. AGL-DSPR09MW ...... ...... 9 m with light fabric bag. DOUBLE. 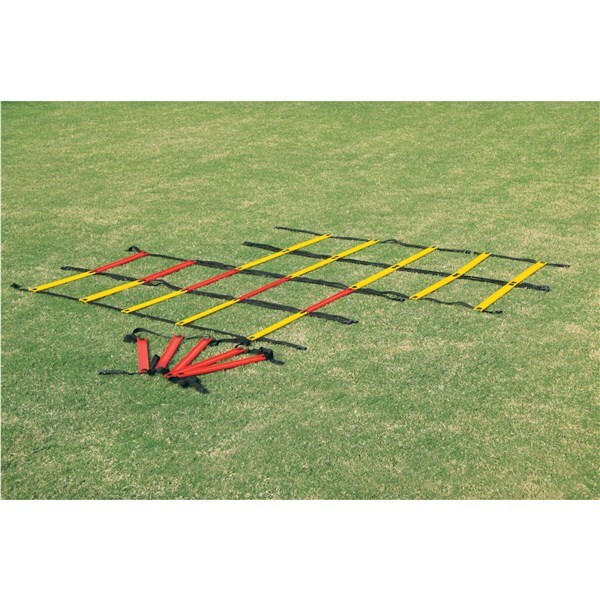 Vinex has innovated a unique set of CRISSCROSS STICKS with anti-skid function so that agility drills can be practiced indoors too. 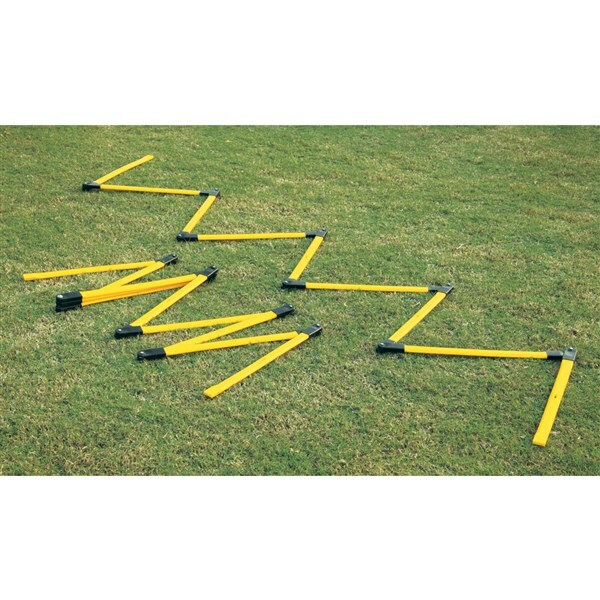 This set of soft and flexible Agility Sticks is perfect for schools. It can be used to perform different kinds of drills by adjusting the sticks in different directions from simpler to more complicated drills. This set of crisscross sticks comes in single colour and 6 colour options. Please ask for more details. AGS-ASCC04 ...... ...... 4 m long with bag & SINGLE colour. AGS-ASCC09 ...... ...... 9 m long with bag & SINGLE colour. AGS-ASCC04MC ...... ...... 4 m long with bag & MULTI colour. 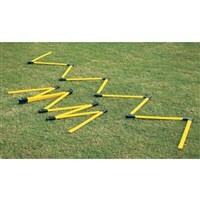 This set of agility CRISSCROSS STICKS is made of plastic. It can be used to perform different kinds of drills by adjusting sticks in different directions from simpler to more complicated drills. 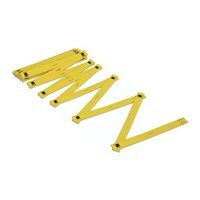 This set of crisscross sticks comes in single colour and 6 colour options. Please ask for more details. AGS-CC04 ...... ...... 4 m long with bag & SINGLE colour. AGS-CC09 ...... ...... 9 m long with bag & SINGLE colour. AGS-CC04MC ...... ...... 4 m long with bag & MULTI colour. AGS-CC09MC ...... ...... 9 m long with bag & MULTI colour. Vinex has innovated this new agility ladder 2 in 1, which has flat rungs and has an added advantage that it can be used as fixed or adjustable ladder. Please ask for more details. AGL-2N104M ...... ...... 4 m long with bag made of light weight fabric. AGL-2N109M ...... ...... 9 m long with bag made of light weight fabric. AGL-2N104MP ...... ...... 4 m long with bag made of heavy duty fabric. AGL-2N109MP ...... ...... 9 m long with bag made of heavy duty fabric. 2 rungs each of Red / Yellow / Blue / Orange & Green in 4 m ladder and four rungs of each colour in 9 m ladder. AGL-2N104MC ...... ...... 4 m long with bag made of light weight fabric. AGL-2N109MC ...... ...... 9 m long with bag made of light weight fabric. AGL-2N104MCP ...... ...... 4 m long with bag made of heavy duty fabric. AGL-2N109MCP ...... ...... 9 m long with bag made of heavy duty fabric. 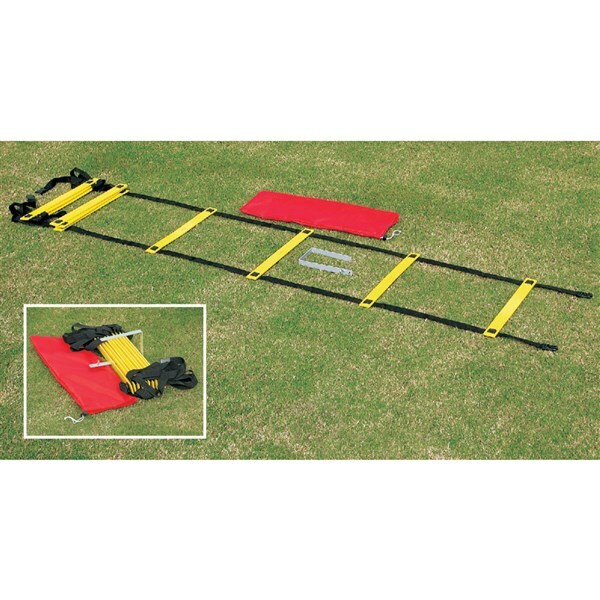 Agility Ladder with flat plastic rungs & carrying nylon bag. 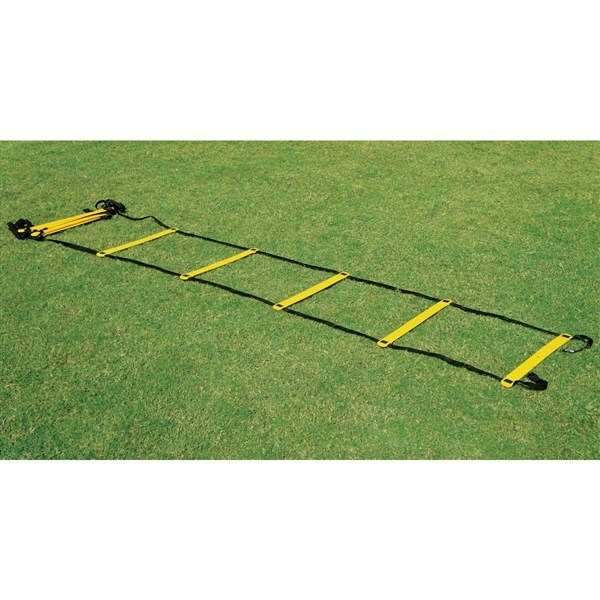 This ladder offers the user to increase or decrease the distance between the rungs for different training needs. The shape of these rungs have been designed in a manner that if the user steps on them, he wont get hurt. Locking clip at the end to join two or more ladders. 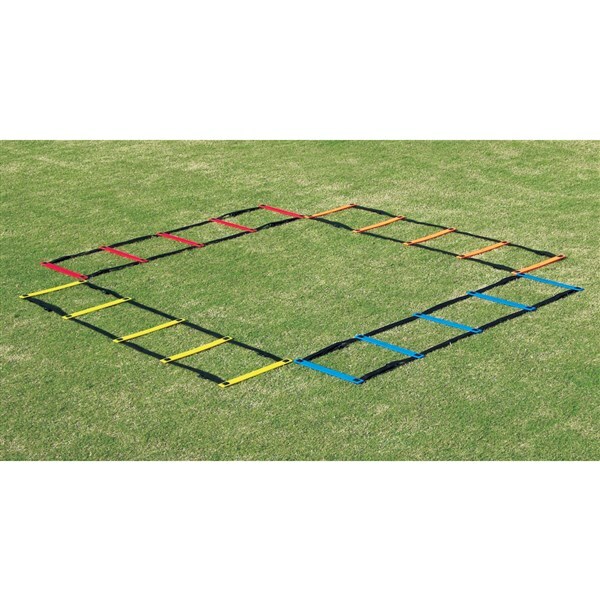 This ideal training aid forces the feet to adapt to extremely fast patterns of footwork by repeating the exercises over and over. For use by young, developing and mature players alike. Each set contains 10x50 cm long poles attached to the belt at a distance of 45 cm. Comes with a bag made of light weight fabric. AGL-FF04M ...... ...... 4 m long with 10 rungs. AGL-FF09M ...... ...... 9 m long with 21 rungs. AGL-FF04MWH ...... ...... 4 m long with 10 rungs, with Carry Handle. AGL-FF09MWH ...... ...... 9 m long with 21 rungs, with Carry Handle. 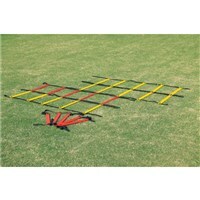 Agility Ladder made of web, comes with 4 ground spikes to hold the ladder. 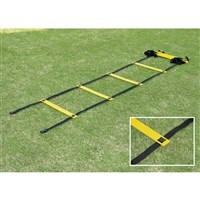 Light weight ladder and economical in cost. It comes with a polyester mesh bag. AGL-W04M ...... ...... 4 m with 10 rungs. AGL-W09M ...... ...... 9 m with 21 rungs. A new innovation in agility ladder by Vinex that offers ultimate flexibility to an Athlete / Trainer in selecting and designing the most appropriate layout of the ladders. 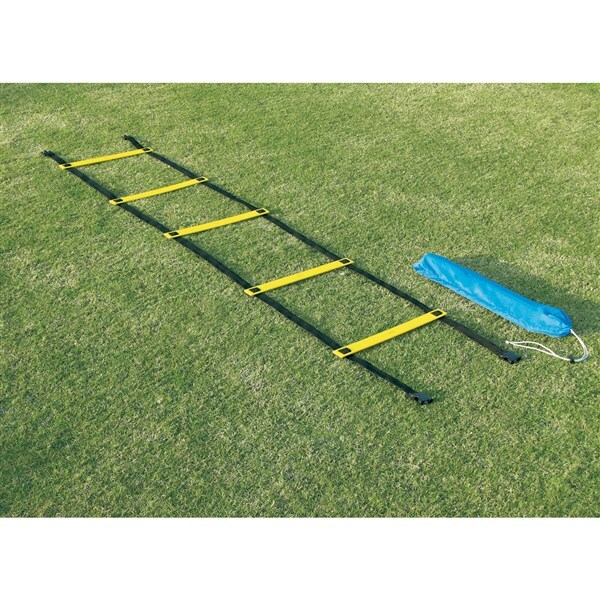 These ladders can be designed to make the most simplest form of ladder to the complex depending on the type of sports and intensity of the training. The innovative design makes a lot easier for the user to join 2 or more ladders sideways using side clips to make a Double / Triple Ladder. The length of the ladders can also be increased using regular extendable clips at both ends. These ladders are available in several different variants as mentioned below. The rungs of the ladder are adjustable. Please ask for more details. 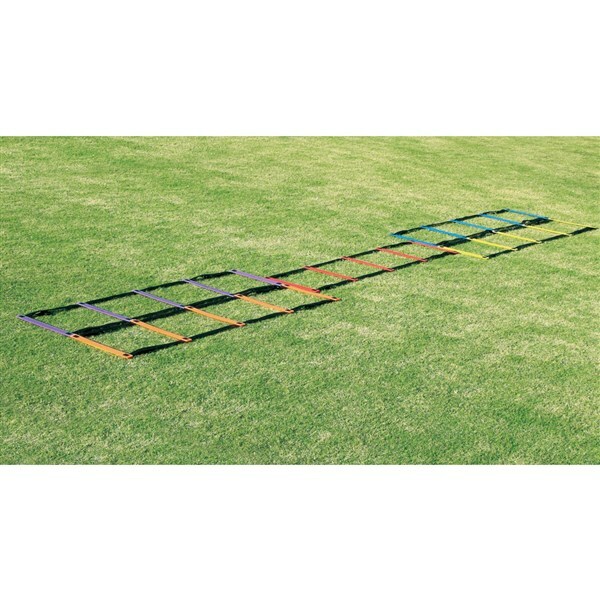 Vinex has innovated a newly designed Agility Ladder with anti-skid function so that the Agility Ladders can be used both indoors & outdoors more conveniently. 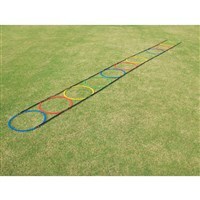 This soft and flexible Agility Ladder is perfect for schools & clubs. 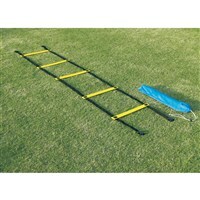 It provides better grip than other plastic agility ladders. Rungs are attached to the belt at a distance of 45 cm. 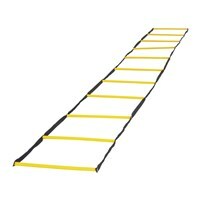 This ladder comes in 6 colours as a standard. Also available in single colour. Please ask for more details. AGL-AS09M ...... ...... 9 m long with bag made of light weight fabric. SINGLE COLOUR. 42cm WIDE RUNGS. AGL-AS04MP ...... ...... 4 m long with bag made of heavy weight fabric.SINGLE COLOUR. 42cm WIDE RUNGS. AGL-WAS04MC ...... ...... 4 m long with bag made of light weight fabric.FIXED RUNGS.57cm WIDE RUNGS. AGL-WAS09MC ...... ...... 9 m long with bag made of light weight fabric.FIXED RUNGS.57cm WIDE RUNGS. AGL-WAS04MCP ...... ...... 4 m long with bag made of heavy weight fabric.FIXED RUNGS.57cm WIDE RUNGS. AGL-WAS09MCP ...... ...... 9 m long with bag made of heavy weight fabric.FIXED RUNGS.57cm WIDE RUNGS. 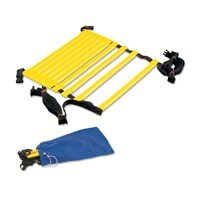 AGL-WASA04MC ...... ...... 4 m long with bag made of light weight fabric.ADJUSTABLE RUNGS.57cm WIDE RUNGS. AGL-WASA09MC ...... ...... 9 m long with bag made of light weight fabric.ADJUSTABLE RUNGS.57cm WIDE RUNGS.